One of the coolest things I received for Christmas was a Metrokane Rabbit Wine Aerating Pourer . It's a device that you insert right into the bottle opening and pour into a glass as you normally would. 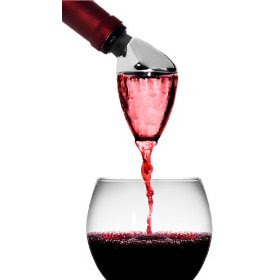 The wine swirls through the aerating pourer and opens up its bouquets before it reaches the wine glass. If you are like me and always forget to uncork your wine several hours before drinking to let it breathe, then this is for you. It even dares you on the product's box to do a taste test. So naturally I obliged. I opened up a pretty good bottle of Zinfandel. The glass that I drank straight from the bottle was aggressive and a bit too acidic. Next I poured it through the aerator and it was noticeably different. It was smoother and had more body; as if I had let it breathe for a while. I must be quite cynical because I'm always surprised when things do what they're supposed to. Here's to better tasting wine in my future! Thank you for the wonderful gift, Kath!! !